Sharmila Gaine (14) eloped and married two years ago to Gakku Gaine (18) and is seven months pregnant. Sharmila's mother was supportive and didnt want her to leave education or get married. But Sharmila saw her friends getting married and thought of doing the same. Sharmila repents getting married early and dosent want to have a child. 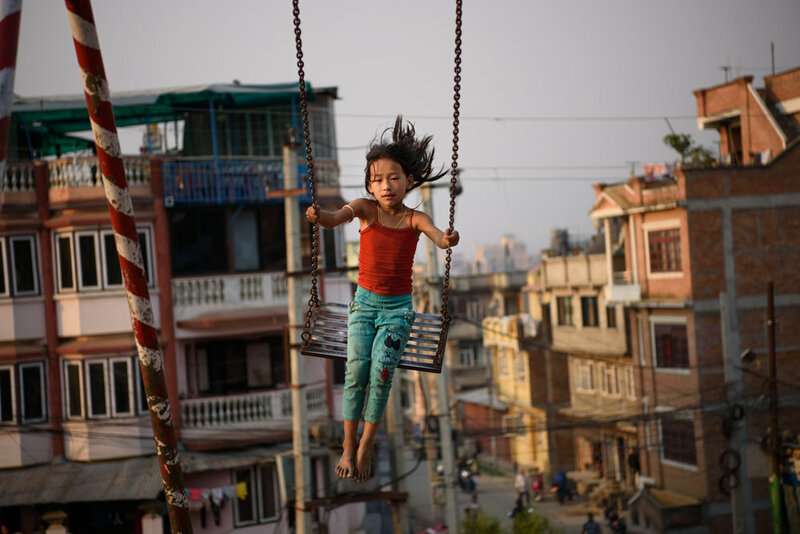 A girl plays at a public park in Patan city, Nepal. Tilmaya Majhi (17) eloped and married when she was 15 to a boy from her community in Malpur Village, Chitwan, Nepal. Tilmaya's father is alcoholic and when she was 11 years old, he took her out of school and sent her to Pokhara to work as a maid. Lalita Badi (17) had an arranged marriage at the age of 12 with an older man. She got pregnant soon and then lost her two babies one after another. Lalita's third child Ritu survived and is now seven months old. Lalita's husband left her a year ago and married another woman and keeps no contact with her. Pratigya Majhi (5) studies in nursery grade and is the only child in the Malpur village community attending a private school. Pratigya's education is supported by a foreigner through a scholarship. Anjana Majhi (17) and daughter Ishita (1). Anjana was pressured to marry by her aunt and uncle because of rumors about her alleged relationship with a boy. Anjana was sent to Pokhara when she was 7 years old to work as a maid in a house to support her family. Pabitra Maskemagar (16) eloped and married a man of her choice to get away from the hard economic conditions at her parent's home. Pabitra now lives with her in-laws, three sister-in-laws and brother-in-law, and cooks for all the members of the family. Her husband lives in Gurgaon , India and works as a cook in a small restaurant. Ganga Maskimagar (17) at her home in Majhi Shivir, Chaumala, Kailali, Nepal. 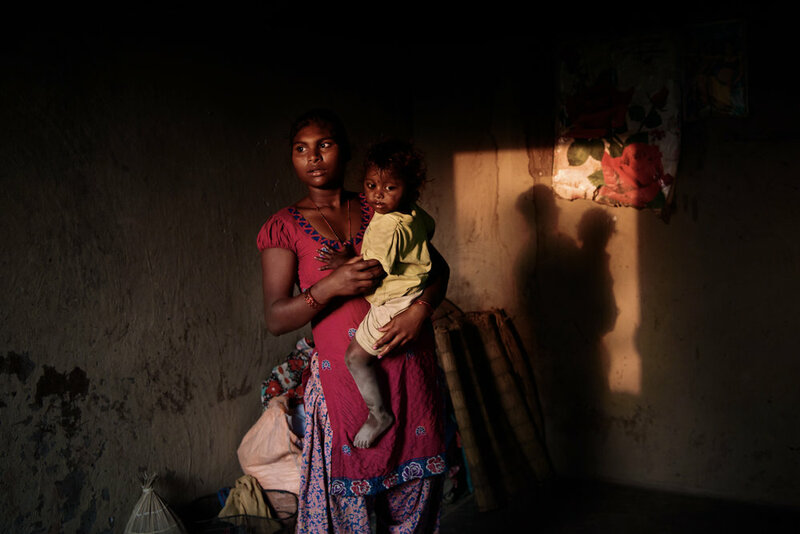 Ganga had an arranged marriage and is five months pregnant. Her husband works as a cook in a restaurant in Delhi. Sarita Majhi (17) with her five months old daughter Sumita at her home in Malpur Village, Chitwan, Nepal. Sarita says she was not interested in studies and left education after class 7. She eloped and married Shiva (20) who works as a labourer in Delhi. Ganga Maskimagar (17) helps her sister Kalpana Paharaimagar (19) at her home in Majhi Shivir, Chaumala, Kailali, Nepal. Both Ganga and Kalpana's husbands work in India to support their families. Lalita Badi (17) with her mother and seven month old daughter Ritu at their home in Majhi Shivir, Chaumala, Kailali, Nepal. Lalita had an arranged marriage at the age of 12 with an older man. She got pregnant soon and then lost her two babies one after another. Lalita's husband left her a year ago and married another woman and keeps no contact with her. Selina Tamang (9) helps her sister Bipana Tamang (11) to wash utensils and prepare for dinner at their home in Badikhel, Lalitpur, Nepal. Bipana goes to school but Selina dropped out of school because of excessive bullying. Both the girls work in the brick kiln to assist their parents. Sharmila Gaine (14) and Sharda Das(15) at Majhi Shivir, Chaumala, Kailali, Nepal. Sharda studies in school and dosent want to get married early like the other girls of her community. Sharmila eloped and married at 12 and is seven months pregnant. Sharmila regrets getting married early and dosent want to have a child. Manju Majhi (16), Tilmaya Majhi (18) and Sangeeta Majhi (19) wait for their children's treatment outside a doctor's chamber in Baghmara, Chitwan, Nepal. Sujita Majhi (14) holds her six month old neighbour Sumina. Sujita studied till class 5 and then dropped out of school because of her family's hard economic condition. Sujita wants to continue education but has no hope that she can do it.